Fulham have signed Stoke City striker Eidur Gudjohnsen on loan for the rest of the season. The 32-year-old Iceland international, a former Chelsea and Barcelona player, joined Stoke on the last day of the transfer window last September. But Gudjohnsen found his opportunities limited at the Britannia Stadium. As he arrives at Fulham, United States international striker Eddie Johnson, 26, goes on loan to Preston North End until the end of the current campaign. The Florida-born forward spent last season on loan at Cardiff City in the Championship, and has also spent time on loan with Aris FC in Greece. 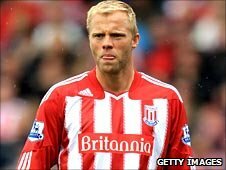 Gudjohnsen agreed personal terms with Fulham before passing a medical, which was carried out in Stoke so that his loan deal could be completed in time.